Does chewing gum really fight cavities? The short answer is Yes, but there are important things to know before you begin popping countless pieces in your mouth. Many studies have shown that chewing sugarless gum for 20 minutes after you finish eating can help to prevent tooth decay. Did you catch a caveat in that sentence? Sugarless gum must be chewed. Don’t go reaching for Hubba Bubba or Juicy Fruit, as those are full of sugars. Chewing sugarless gum is meant to increase the flow of saliva and wash away sugars from the mouth. After eating, your mouth is left with tiny particles of foods that get stuck between the teeth and inside the deeper grooves of the back teeth. When these particles remain in the mouth, bacteria begin to attack them. These bacteria produce acid that is very damaging to the teeth and will cause cavities if not removed on a regular basis. Chewing sugarless gum helps to produce extra saliva so that these tiny particles of food can be washed away instead of hanging out on the teeth until you are able to brush them. It is essential that you chew sugarless gum. Look for chewing gum with the ADA Seal because these gums are sweetened by non-cavity causing sweeteners such as aspartame, sorbitol, mannitol, or xylitol. It is also essential that you do not chew gum constantly throughout the day. The constant chewing motion and stress on the jaw joint can cause discomfort or even TMJ. 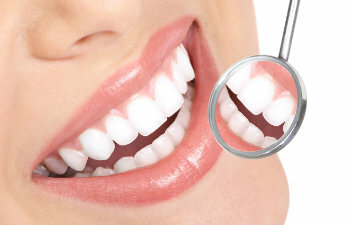 At Gold Hill Dentistry, we are here to help you achieve optimal oral health any way we can. We can recommend a sugarless chewing gum for you in you are a gum chewer, or we can help find other methods of cavity prevention. Contact us today!